Picked the first tomatoes from the garden today. Zucchini, yellow squash and lettuce are in high production mode and its going to start warming up over the next few days. Summer’s here! We first made this in Roatan and sent in the recipe, but forget to take a picture. It’s taken us a minute to make it again, but with all this produce coming in – it’s a no brainer! Put all of above in zip lock back and refrigerate overnightc – this ‘cooks’ the seafood. Alternatively, if you’re in a hurry, you can flash cook the seafood in lemon juice by simply heating 1/2″ of juice in a large frying pan, heat to boiling and add the seafood for about 45-90 seconds, until cooked depends on size of pieces. mild – use one jalapeño and discard the seeds. Mix together marniated seafood, tomatoes, red onion, jalapeño and cilantro. Let sit 30 mins at room temp. Cubed to same size as other veggies and fish. Mix in gently when ready to serve. oh how I love ceviche! But I’ve never made it. By the way, the plantains below look insanely good! I’ve never had it with lots of vegetables like that. With a glass of wine and some crusty bread, it’s a whole meal! I love the ceviche I get at Cafe 28 in Chicago. This is a recipe I’m totally going to have to try. 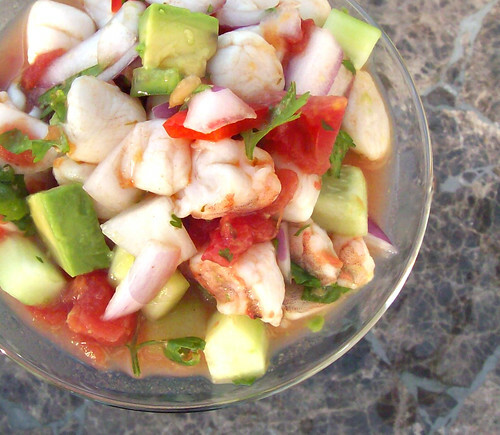 Thank you for posting your CEVICHE recipe! My mouth is watering just thinking about it. Can’t wait to try this recipe out for my sweetheart!! Thank you Charlotte! I’ll be peeking in from time to time!